Aroview: A charming Pixar film based on the Mexican holiday The Day of the Dead, that proves to be more than just a bunch of Halloween cliches. 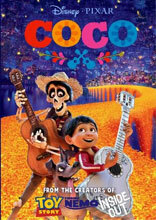 The story follows a Mexican boy called Miguel, who dreams of being a musician but accidentally ends up in The Land of the Dead. Smart story-telling which draws from a fascinating and thought-provoking folk myth.